Basseterre, St. Kitts (CUOPM) – The Federation of St. Kitts and Nevis will highlight the 30th Anniversary of diplomatic relations with the Republic of China (Taiwan) with the release of a set of postage stamps. Postmaster General, Ms. Sandra Davoren said Wednesday, the eight 30 cents stamps, to be issued by the General Post Office, feature the nature and history of both island nations as well as the areas of economic cooperation which highlight Taiwan-financed projects of the special relationship. 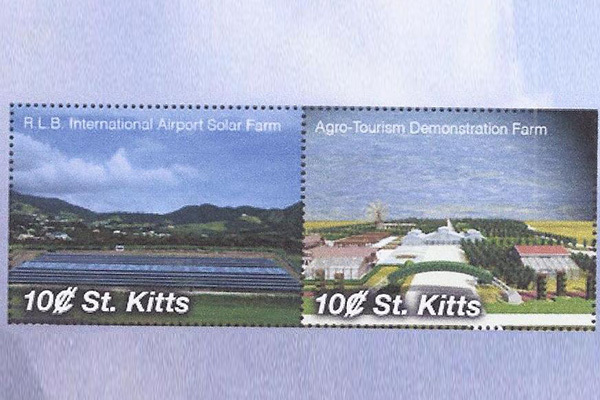 Imagines on the stamps are The Robert L. Bradshaw International Airport Solar Farm, a cooperative project between the governments of St. Kitts and Nevis and the Republic of China (Taiwan), generating one megawatt of energy per day. The solar modules are arranged to say “Welcome to SKB,” greeting arriving passengers and showcasing the country’s role as a leader in renewable energy development in the CARICOM region. The Agro-Tourism Demonstration Farm is another example of the fruitful cooperation between the two countries, combining local traditional agriculture with high value-added tourism. The state-of-the-art farm, featuring greenhouses and tea rooms, produces many different herbs and fruits, and makes extensive use of solar power. Offering great hospitality, it promises to boost economic development. Port Zante, located in Basseterre, St. Kitts, is a landmark destination for many international cruise ships. Port Zante welcomes nearly 800,000 passengers annually and serves as a remarkable access point to St. Kitts and Nevis. TAIPEI 101, also known as the Taipei Financial Center, is among the most famous skyscrapers, and was the tallest building in the world between 2004 and 2010. It has also become well known for the annual fireworks show held on New Year’s Eve. Brimstone Hill Fortress National Park is a UNESCO World Heritage Site and one of the best preserved fortifications in the Caribbean. It illustrates the rich history of St. Kitts and Nevis, as well as the country’s great importance in the region. Mount Liamuiga, a 1,156-meter dormant volcano, is the highest mountain in St. Kitts and Nevis. Liamuiga means “fertile land,” which aptly characterizes this wonderful country. Mount Jade, at 3,952 meters, is the highest mountain in Northeast Asia. During winter, its snow-capped peak offers an extraordinary sight that symbolizes Taiwan’s natural beauty. The stamps are to be released by the end of January/early February 2014.